Daymet: Developed by Dr. Peter E Thornton to fulfill the need for daily climatological data necessary for plant growth model inputs, Daymet generates daily, gridded surfaces of temperature, precipitation, humidity, and radiation over large regions and takes into account areas of complex terrain. 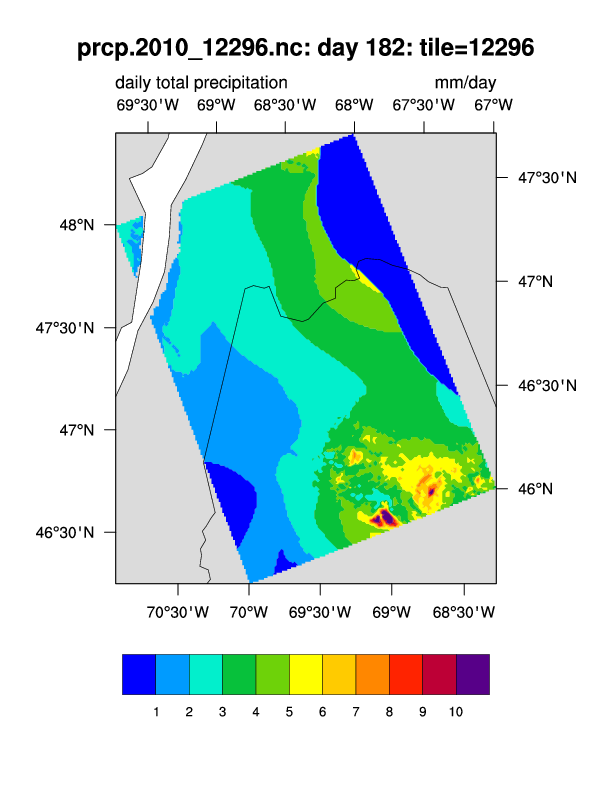 The data are available as a suite of 2x2 degree tiles. Each tile contains 1km x 1km gridded values and is available as a netCDF file. The tile locations cover land areas from Mexico to southern Canada. Due to the convergence of the meridions, the grid size of each tile can vary. Dave Allured of the NOAA/PSD/CIRES Climate Analysis Branch posted the following to ncl-talk@ucar.edu. Multiple tiles can be efficiently joined in a single program run. Common grid point between tiles is no longer required. Missing 2-D coordinates in gaps between tiles are automatically filled in. New diagnostics to ensure correct spatial alignment are included. Support for larger output files is improved. The most significant feature is infill of missing 2-D coordinates. Output from previous versions left zeros in portions of the 2-D coordinates, which made these files very difficult to use with some graphics systems such as NCL. This problem is now completely solved, thanks to a new supplemental coordinate file provided by Daymet/ORNL. 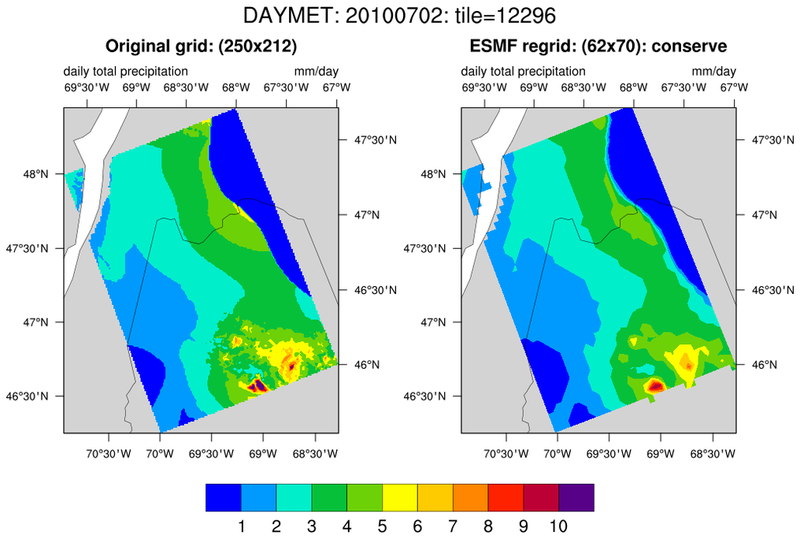 daymet_1.ncl: Read a Daymet netCDF file containing an individual 2x2 degree tile and plot on the native Lambert Conformal projection. The default background is used. The state of Maine and the St. Lawrence Seaway are clearly visible. 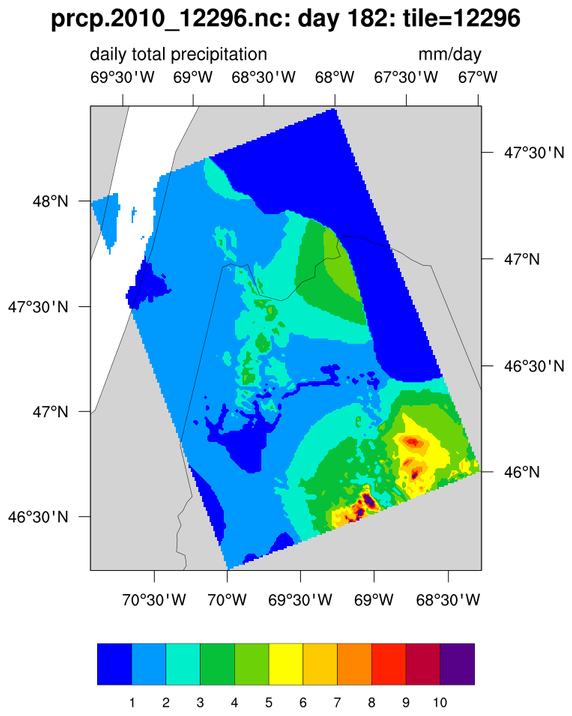 daymet_2.ncl: Interpolate data from a high resolution 2x2 degree tile (here, 250x212 containing 1km x 1km values) to a coarser resolution (62x70) rectilinear grid using ESMF conservative interpolation. The medium resolution map background is used for the plots. The script produces 4 netCDF files. Three associated with the ESMF regridding software: (i) a weight file which can be used to regrid other variables from the same tile; (ii) a 'SCRIP style' file containing a description of the source (daymet tile) grid; (iii) a 'SCRIP style' file containing a description of the destination rectilinear grid; and, (iv) a file containing the regridded variable. daymet_3.ncl: This is a variation of Example 2. 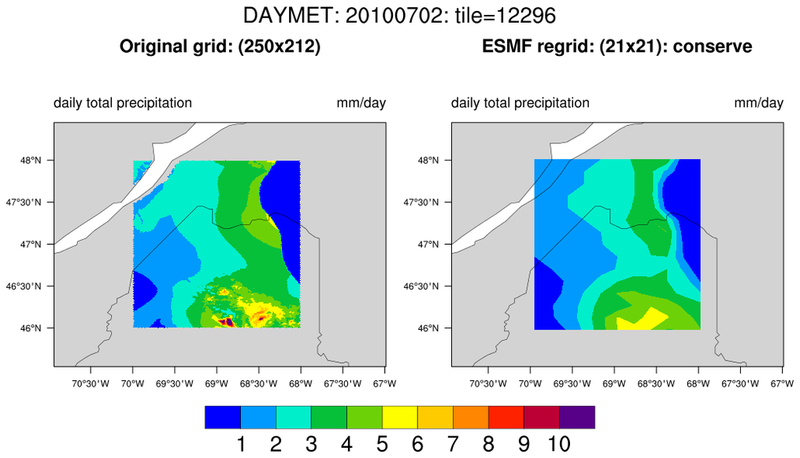 The data are plotted on a cylindrical equidistant background to more clearly illustrate the two degree nature of the original Daymet 2x2 tile. Also, the data are interpolated to a relatively crude 0.1x0.1 degree grid (21x21) using conservative interpolation. since one degree of latitude is approximately 111.1 km/degree-of-latitude. For tile 12296, the result is a grid of size 56x56.